Laurent Limboerg graduated from EF Academy in 2018 with an IB Diploma. As soon as he graduated from high school, he went to Japan to learn Japanese for 4 weeks. Laurent has roots in Russia, Belgium, and the U.S. but became interested in Japan and studying the language as an international student during high school. Having grown up in the U.S. he speaks English fluently and also grew up speaking French and Dutch. He can understand Russian and with Japanese, he expands his skills as a polyglot. In the future, he wants to study business and has many interests from owning a retail brand to a Japanese restaurant. He was kind enough to sit for an interview about his experience studying in Japan. How was your experience at EF Academy? Although I struggled to understand cultural differences at first, I made friends with students from various countries like Japan, Russia, Mexico, China, Italy, Kazakhstan, and African countries. My favorite classes were History and English. The teachers in the university guidance team also really cared about me. They helped guide me through the application process and the team was proud when I received offers from American universities. Mrs. Ciella, our university guidance director, even gave me a hug. What was your favorite part of Japan? I like the politeness of Japanese people. The city is always clean and I don’t find any trash on the roadside. I love Japanese foods and I think the culture is really cool. I love how everyone can express their own individuality such as the Harajuku-fashion. I’m also really glad that Japanese people were interested in me and made me feel welcome in their country. What are some things you don’t like about Japan? I really can’t find anything. But the only thing I didn’t really like was the morning trains. They’re always too crowded! Which course do you study? Now I’m taking a 4-week Japanese course, and I’ve learned Hiragana (A type of Japanese characters). I live with my host family and they are really nice. Since my father had many cool manga comic books, I started to be interested in Japan when I was little. It became my dream to come to Japan. 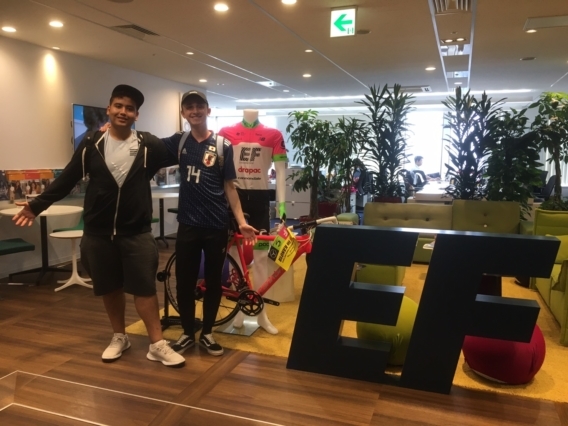 While I was studying at EF Academy, I loved it when Japanese students would join our school so I could learn more about their culture. And when I realized I could go to Japan to study the language with EF, I was really excited. I look forward to coming back here and when I do, I’ll stay with my host family again.